Plyometric exercises are often the best forms of exercise because they provide a full workout. These exercises improve speed and power and a they involve fast, dynamic movements. These actions require you to use a ton of power and energy. While burpees, skipping rope and jumping squats are all forms of plyometric exercises,battle ropes are top choice for supermodel Naomi Campbell. With a body at 48 which many of today’s Victoria Secret models work hard to emulate, any fitness tips from the ageless supermodel are gladly accepted. Recently, Naomi Campbell’s personal trainer showed off the model’s battle ropes skills on Instagram, and it’s safe to say she was definitely hitting those ropes hard. Battle ropes involves one pounding (or waving and slamming) ropes against the ground as quickly as possible. With the weight of the ropes and the resistance generated from the fast swings, battle ropes provide a high-intensity, whole body workout. This explains why battle ropes are used by a variety of athletes that include football players, boxing champions and MMA fighters. Personal trainer Kelvin Gary explained to Self magazine exactly why so many athletes regularly use battle ropes. “This exercise uses all the muscle groups in your upper body—shoulders, biceps, triceps, lats, and pecs—as you whip the ropes down”. With it being a full body workout, there are a lot of benefits that come from hitting these ropes. 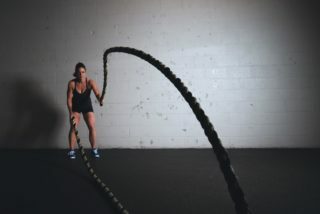 Battle ropes use high intensity, high-speed movements and these motions can boost cardiovascular capacity. Why is this important? Any form of exercise that cranks up cardiovascular capacity boosts the heart’s strength and a stronger heart can better pump blood to different parts of the body as well as lower blood pressure. It’s said that many life lessons can be learnt in the fitness realm and this is quite accurate. 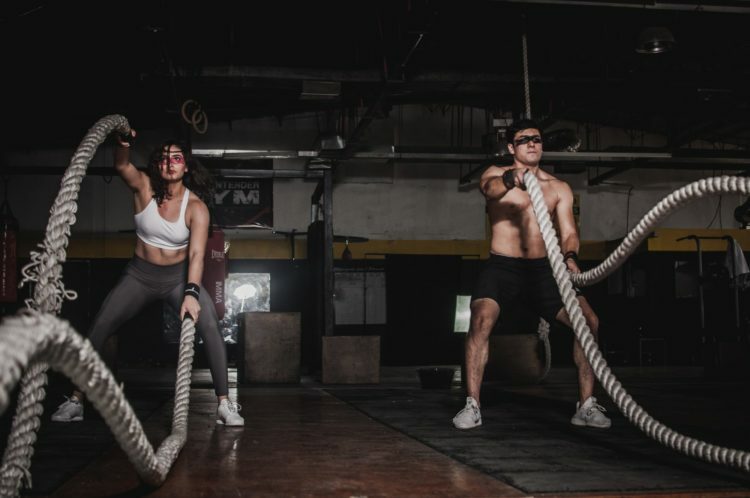 The intense workout that comes with consistently using the battle ropes requires a lot of willpower, especially when both your lungs and muscles start to ache. However, with regular training, you’ll soon find that your resolve has become much stronger and this new-found mental strength can be applied to everyday life. While we aren’t able to match Naomi Campbell’s walk on the runway, we can try a hand at matching her on the battle ropes. However, Gary recommends starting at a beginner’s level. Stand with your feet slightly wider than shoulder-width apart, knees bent in a half-squat, and hold one rope in each hand. Alternate arms in a wave motion for 20 seconds. While Campbell used both hands at once, Gary suggests starting with single-arm waves. The use of both hands at once requires a higher volume of work, and you may get quickly burned out. Gary’s recommendation is to incorporate 2 to 3 sets of 20 seconds into a larger workout. When using battle ropes, it’s important to keep your core stable, knees bent, and elbows flexed throughout. Gary has noticed how easily people can forget about these factors, potentially increasing their risk of injury. “One of the big mistakes I see is people keep their arms straight and are just whipping the ropes with their shoulders, which can potentially overwork the shoulders,” he says. Battle ropes are not only a full body workout, but they are also versatile. This allows you to try different variations in order to get a good workout in. One woman who has really discovered the secret to looking half her age – and figured out how to have her diet help her do that – is Jennifer Aniston. Click here to discover the secrets of her Zone Diet and how you can apply it to your own lifestyle.